The book begins with a description of how economists realized the destructive nature of market forces in the era when railroads were the largest industry in the USA. That description alone is worth the price of the book because, of course, the lesson fully applies to pharmaceuticals, software, and many other industries today. Many of the leading economists at the time came to grips with the destructive nature of market forces. Competition, which according to conventional economics is supposed to guide business to make decisions that will benefit everybody, was driving business into bankruptcy and common people into poverty. This lesson was never allowed to take hold among economists. In fact, the same economists continue to teach their students that markets work in perfect harmony, while they advised policy makers to take quick action to put the brakes on competition. The two-faced behavior continues today, with prominent economists defending monopoly as key to profitability for pharmaceutical and software companies — and for the same reasons that the railroad economists recognized — while teaching students and the rest of us that relying on the market produces the best world for all. Chapter 1 describes the transition from political economy to just plain economics — and why. Perelman sets the age of classical political economy as the period from Adam Smith’s Wealth of Nations in 1776 to around 1830. Rather than defend the prerogatives of the crown, these economists sided with the rising middle class. “The leading political economists, such as Smith and David Ricardo, called for political changes that would make the economy conform to the norms of the market, what economists called ‘laissez faire’.” And they contended that the interests of business coincided with those of society as a whole. The analysis of exchange, rather than the analysis of production was the key to refuting Marx, so the economics profession turned to a theory of markets rather than a study of industry. Contemporary economists still advocating the failed deregulation of electric power label their ongoing advocacy as the study of energy markets and pointedly ignore the energy industry. 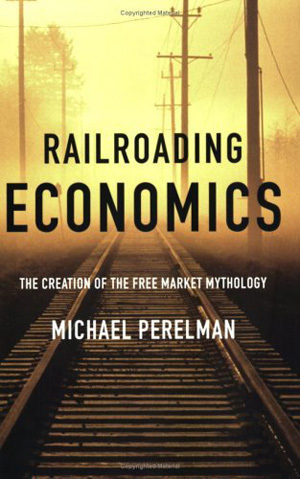 Perelman is most powerful as he turns in Chapter 3 to “Railroads and Fixed Capital.” Railroads illuminated for economists the problem of fixed investment. Large investments drove down costs, leading rivals to either cut prices or themselves make large new investments in new technology. Excess capacity led to price wars, so that investments could not pay and bankruptcy and hardship followed. The description of the work of Charles Francis Adams, Jr., great-grandson of President John Adams and grandson of President John Quincy Adams, is both charming and illuminating. Adams studied railroads rather than economics. “Building on his intimate knowledge of the railroad industry, Adams concluded that the underlying assumptions of conventional economic theory made no sense at all for understanding railroads.” Perelman goes on to quote Adams’ rejection of market solutions to reach a “. . . conclusion which is at the basis of the whole transportation problem: competition and the cheapest possible transportation are wholly incompatible” (emphasis in Adams’ original). If only a commanding figure today would publish the same sentence, substituting pharmaceuticals, software, airlines, and electric power for railroads!
. . . just as polite public opinion, as well as the corporatist economists, was beginning to shift to accept the legitimacy of trusts, cartels and monopolies, groups of academic economists were forging an elegant mathematical defense of the market that remains the core of economics teaching to this day. According to their system of Panglossian proofs, markets provide the best of all possible worlds. Even many of the corporatists still abstractly approved of conventional economic theory and doggedly taught neoclassical theory to their students. That observation holds true today, with eminences like Larry Summers, ex-Secretary of the Treasury and deposed president of Harvard defending monopoly as the only way to profits in pharmaceuticals while genuflecting to the market as providing the best of all possible worlds. Nothing has changed.
. . . a capitalist economy naturally evolved into a small number of large industrial firms. . . . The corporatists differed from the socialists in only one fundamental regard: the socialists did not believe that a society in which one group owned the wealth and another worked for wages could ever produce a fair and equitable outcome. In contrast, the corporatists taught that once corporations rather than markets had the right to manage society, the corporations would act responsibly, providing good wages along with a strong economy. Today, financial markets will no longer allow management to sit still. Now management must react quickly and decisively. Unfortunately, many of these decisions violate the interests of workers and consumers, society as a whole, and even the long-term health of the business that these managers control. 23 pages of footnotes support Perelman’s arguments. The book leads to a good understanding of why markets fail, and how, knowing that, economists continue to teach the lie that the best of all possible worlds will flow from letting the market decide everything. Eugene Coyle, Ph.D., is an economist with more than 30 years of experience with utility regulation. He is an independent consultant, and his clients include TURN, the American Public Power Association, and the governments of Brazil and Mexico. He has also served as an adviser to Commissioner Carl Wood of the California Public Utilities Commission. His research helped the Korean Electrical Workers Union to successfully block privatization of electric power in Korea.